Only voters registered prior to the Nov. 8 election can cast a ballot, but registered voters who did not vote on Nov. 8 are eligible to vote on Dec. 6. 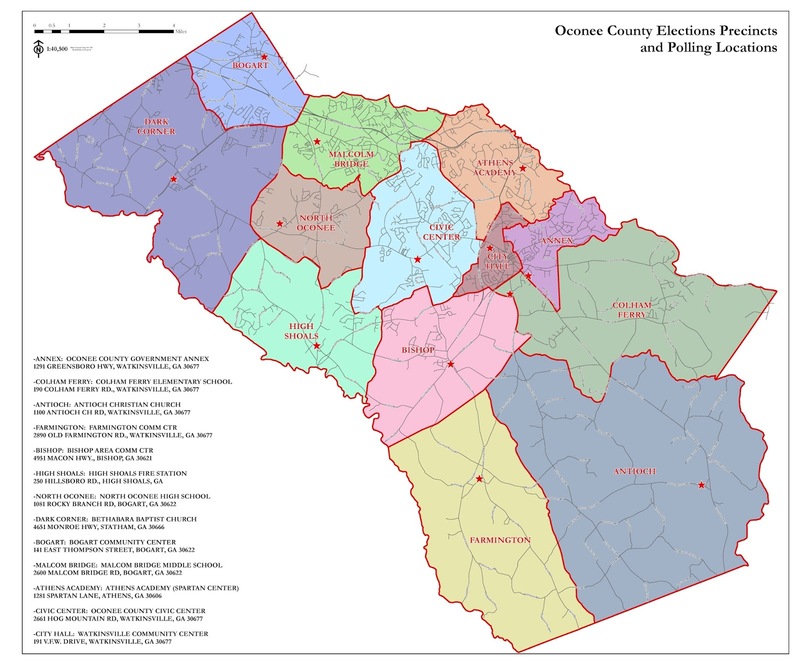 Only 4,253 voters participated in the runoff in July of 2014, the last time Oconee County had a runoff in a Commission race. That was in a primary. The 4,253 contrasts with the 17,763 who cast a ballot for the three candidates in the Nov. 8 special election, when Chuck Horton got 45.2 percent of the vote, Marcus Wiedower got 30.2 percent, and Ben Bridges got 24.0 percent. Horton and Wiedower will meet in the runoff on Dec. 6. 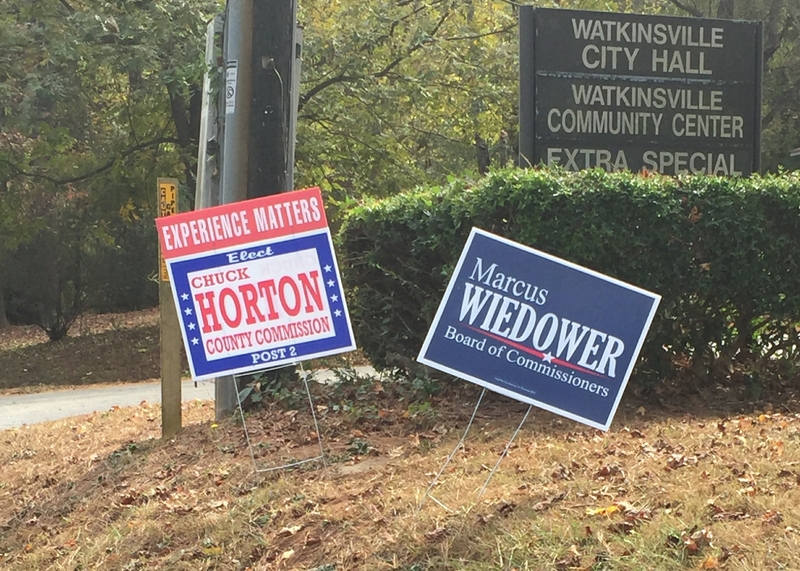 As of Friday, Dan Matthews was ahead of Mark Melvin by one vote in the Watkinsville City Council Post 5 election, and Board of Elections and Registration Chair Pat Hayes said the maximum number of additional votes that could be counted and certified in the race by the end of the day on Monday would be three. Horton won 12 of the county’s 13 precincts, but the margin of victory was only one vote in the Bishop Precinct. Wiedower won the High Shoals precinct, where he has been active in the county schools, and did well in the City Hall Precinct, which is his home precinct. 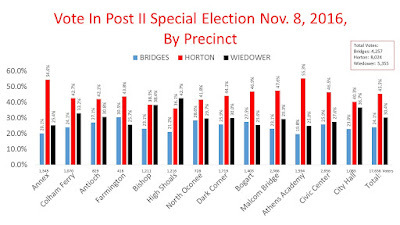 Horton did very well in the Athens Academy and Annex precincts. Annex is his home precinct, but it also is the precinct of homeowners along Calls Creek. Athens Academy includes the subdivisions along Daniells Bridge Road. (It is my home precinct). Horton has stated he will not vote to put a sewer line down Calls Creek and that he is opposed to a flyover of Daniells Bridge Road to meet up with the Oconee Connector at Home Depot. Wiedower has said he wants to explore options to the Calls Creek sewer line and that he favors the flyover, though he said he wants a design that will have minimal impact on the residential neighborhoods along Daniells Bridge Road. Horton did better in early voting (47.0 percent) than in voting at the polling place (42.3 percent). 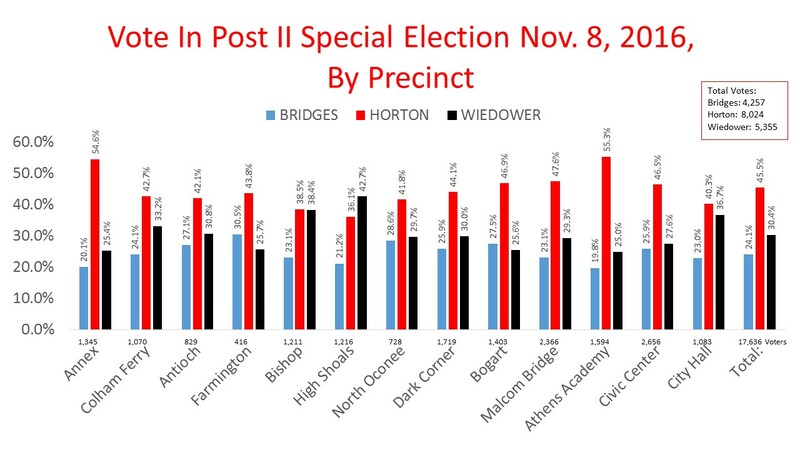 Wiedower and Bridges did slightly better on election day than in early voting. Bridges’ vote was spread more evenly across the county’s 13 precincts, with Farmington in the far south of the county producing his highest percentage. He ran just above his average in Civic Center, his home district. The precincts are not even in size, as the numbers in the chart just above the precinct names indicate. Turnout for the BOC special election ranged from a low of 69.5 percent in Athens Academy to a high of 77.8 in High Shoals, with turnout across all precincts at 73.2 percent, or 73.8 percent if write-ins are counted. Turnout for the election overall was 85.0 percent. Civic Center, Malcom Bridge, Dark Corner, Athens Academy and Bogart are the county’s largest precincts, in that order, each with more than 2,000 registered voters. In calculating the vote percentages in the chart above, I left out the votes of 127 individuals who wrote in the name of someone other than Bridges, Horton or Wiedower. The data available at the precinct level did not include those 127 votes. Since none of the three candidates got more than 50 percent of the vote on Tuesday, the top two moved to the runoff. The winner on Dec. 6 will be the candidate who gets his supporters back to the polls. Wiedower had 5,355 votes on Tuesday, to Horton’s 8,024, so both have enough voters to win a low turnout election if they can get their supporters to the polls. In the July runoff in 2014, William “Bubber” Wilkes got 51.2 percent of the votes cast, or 2,178, to win the Post 4 race. Wilkes had come in second in the May Republican primary, with 37.6 percent of the vote. Margaret Hall had gotten 41.6 percent of the vote in the first round, and Maria Caudill had 20.8 percent. Bridges had told WGAU’s Tim Bryant that he was going to make an endorsement and scheduled an appearance of Bryant’s radio program on Friday morning to indicate his choice. Bridges told me he didn’t know if his supporters would stay at home or pick between Horton and Wiedower in the runoff. Bridges did say he will be talking with both of the candidates over the next weeks. Post 1 Commissioner Jim Luke, who is retiring at the end of December, has contributed to Horton’s campaign. Commission Chairman Melvin Davis, whom Horton challenged for the chair position in 2012, had a Wiedower sign in front of his house before the election. Commissioner Wilkes also had a sign for Wiedower on his property south of Watkinsville on Saturday and has shared Wiedower’s campaign materials on Facebook. Horton successfully challenged and unseated Wilkes, then holding Post 4 on the Commission, in 2004. Mark Saxon, who was reelected to his position as Post IV Commission on Tuesday without opposition, did not have a sign in front of his house on Tuesday and told me he is not endorsing either candidate. John Daniell, who resigned from the Post II position in March, creating the need for the special election, told me today he is not endorsing either candidate. Daniell was elected as Chair of the Commission to replace Davis on Tuesday. He did not have opposition. “We’ve got a really big agenda ahead of us and I want to start off with good relations with all of the commissioners,” Daniells said. Daniells did not have a sign in front of his house when I checked on Tuesday. Mark Thomas, who ran unopposed for Luke’s Post I position on Tuesday, did have a Wiedower sign in front of his house when I passed on Tuesday. Thomas said the sign was put up by his wife and that it was the same situation as mine, where my wife put a sign for Horton in our front yard. My wife also contributed to Horton’s campaign, as I have reported. "I'm not going out as an elected official and endorsing,” Thomas said. “Any time you are an elected official, this is not a good thing to do." I noticed Friday that someone removed my wife’s sign from our front yard. She said she didn’t take it down. Voters on Tuesday overwhelmingly approved the sale of liquor by the drink on Sunday and the Sunday sale of package beer and wine in grocery and convenience stores. In both cases, the yes vote was 68.2 percent. By Thursday, the county had a draft ordinance on its web site to implement the changes to the county’s alcohol ordinance. The ordinance allows package sales during those same hours on Sundays. Hayes from the Board of Elections and Registration told me on Friday that she mailed out three ballots that could have been used in the Watkinsville election that have not yet been returned. If the ballots come in on Monday and were postmarked by Nov. 8, she will be able to include those votes in the final tally for the Post 5 Council seat. At present, Matthews has 569 votes and Melvin has 568. Five people wrote in a name for the race, meaning neither Matthews nor Melvin has a majority. Hayes said no runoff will be needed even if neither gets a majority of the votes. I have several friends that said to me that Mark Thomas had convinced them to vote for Wiedower and they were going to vote for him until they got the attack flyer from Wiedower. After that they had doubts and did more research and changed their minds and did not vote for him. So for Mr. Thomas to say that he did not campaign for anyone is disingenuous. He is just trying to hide his support for the establishment/development community even though he comes from a family of agriculture. If I remember correctly he said that the gravity flow pipeline down calls creek would be the best choice from an engineering standpoint. That might make his land that is the closest to the treatment plant more desirable for development. Perhaps he is a politician talking out of both sides of his mouth saying to the person that he is talking to whatever that they want to hear. Umm, Marcus, there is no possible way to build that completely unnecessary flyover bridge and not have a devastating impact on the residential neighborhoods. But Melvin's best bud's Frank Bishop and Jamie Boswell would sure be happy! Melvin's campaign manager gave Marcus a sweet $1,000 campaign contribution. Need to be sure to vote. Nice reminder of how the person coming in second often wins the runoff. Supporters of the winner of the first round often just assume their candidate will win again - big mistake! "He may not be a sheep eatin' dog, but he sure runs with a pack of them." The pack needs to go. Vote to stop the deal making and conscentrate on a positive direction for Oconee.